The latest marvelous Marvel team-up with accessory maker PDP has resulted in this, the Marvel Edition Versus Fighting Pad, a slightly off-kilter fighting pad coming to the Xbox 360. Coming February 14 for $39.99 USD, Marvel and PDP's wired controller drops the d-pad in favor of a sole thumbstick, one featuring "high quality micro-switch activators" and a "rubberized, over-tooled cap." It is, of course, decked out with Marvel super-heroes, just in time for Marvel vs. Capcom 3, naturally. 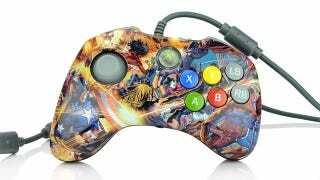 More details, including the limited edition packaging for this new fighting game pad challenger at Marvel.com.